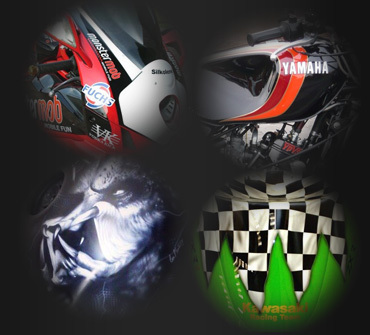 Welcome to Motopaint, specialists in motorcycle custom paintwork. We are a small family business, based in Cradley Heath in the West Midlands. The business was set up in 1999 by Tony Merrett and his son Lee Merrett as a part time venture, painting motorcycles and helmets in a small workshop located not far from where we are now. In 2001, due to the amount of work on our books and increasing custom, we expanded into new premises which we set up ourselves, solely for motorcycle paintwork and cosmetic repair. Acclaimed award winning airbrush artist Giorgio Uccelini came on board, bringing along his unbelievable talent and experience in the custom airbrushing field and we have never looked back. The aim of our business is simple, to offer the motorcycle or scooter rider a quality service in the paintwork and panel repair field. We are all bikers who love different genres, from classic and super sports to cruisers and trikes. We pride ourselves in the work we do, and you can be rest assured in the fact that we all have many years of experience in our fields. with customers winning shows and events over many years as proof of our knowledge. Copyright © 2009 Motopaint. All Rights Reserved | Designed and powered by JDR Group web design.